This is a wrenching first person account of the invasion of Okinawa and the repatriation of the Japanese from Korea. Roland Glenn fought in hand-to-hand combat in Okinawa, an experience he recounts in graphic detail. Glenn's battle experiences have haunted him throughout his life. The consequences on his civilian life find resonance with returning veterans from Iraq and Afghanistan who will require medical and psychological care for the remainder of their lives. This book is a development of the dramatic presentation that he performs as part of the Veterans History Project, a program based at the Library of Congress that captures the experiences of veterans of all wars. 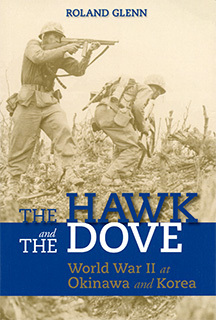 "The Hawk and the Dove is the reality most soldiers don't want to talk about when they come home. That is why this is such a special and important book." Digby Diehl, former book editor of The Los Angeles Times, is the author of more than twenty books, including the recently published Soapsuds.